Gloria graduated from Tucson High in 1961. She participated in the National Honor Society and Girls’ League while at THS. Upon graduation, she received a Marshall Foundation Scholarship to the University of Arizona. At the university, she was a member of the town girls’ organization called Phrateres and served as the vice president. In 1965, Gloria graduated with a degree in Business Education. Ever since she was in high school, she set her goal of becoming a teacher. Her first teaching position was in Tuba City, Arizona where she taught the Navajo and Hopi students for two years. Upon returning to Tucson she became a teacher at her alma mater. That lasted for 23 years. 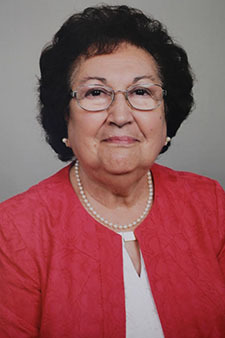 Gloria became the Assistant Director for Bilingual Education in 1990. Her main function was that of hiring bilingual education and English as a Second Language teachers. She also worked with the high schools with bilingual education programs to set their curriculum. During the eight years in the Bilingual Department, she assisted in hiring 450 teachers. In 1998, Gloria was selected as the Assistant Principal for Curriculum and Instruction at Catalina High School. She was responsible for setting the Master Schedule, coordinating the state testing, and supervising the office and counseling staff. After 35 years, she decided to retire. She continues to work in helping students by serving on the Badger Foundation board and has been involved for over 25 years. She has held every position and was the first Emeritus Director. When THS celebrated its 100 years she participated in the Centennial Committee. Presently, she serves on the Endowment Committee as the treasurer. Gloria coordinated the Endowment scholarships that are given to graduating seniors attending Pima Community College as well as those provided by Tucson High alumni. Her community activities include volunteering at her church and planning the class reunions with her classmates.